I was working as at TV news producer at a Canadian broadcaster and one morning I came across a headline “94-year-old former SS officer goes on trial in Germany”. My first thought was: of course he is guilty. But the more I read about his case, and the legal proceedings precipitating the prosecution, I thought that perhaps it wasn’t so black and white, and there was a lot of moral and legal ambiguity here. It made me think about war crimes, culpability, and the statute of limitations, and I thought a documentary would be a great way to unpack these issues and look at it from all sides. There were so many challenges! Making a documentary requires a lot of patience and persistence, and this film tested both of these qualities in me. It took 3 years to make and there were many times when I thought “it’s just not going to work”. Most documentaries have a central character that the audience can get behind…we didn’t have that as this is not a character film. Also, we were not allowed to film in the courtroom in Germany while the trial is taking place. You can only film as people are entering the courtroom. It ended up working out because I think our animation team did a brilliant job at filling in those blanks in a very engaging way. I want to challenge preconceived beliefs about justice, punishment, and culpability. I want audience to ask questions about how we punish war crimes, who is responsible, and what is the statute of limitations. Furthermore, in today’s world, among the tragedies taking place now, how do we define ‘being complicit’? One of the main characters of our film, Eli Rosenbaum, works for the Department of Justice and has helped put more former Nazis behind bars than perhaps any other person. I am so glad to bring this film to his hometown. Also, this film asks a lot of questions about government responsibility and prosecution when dealing with genocide, so it is great to be able to screen it in the political centre of the United States. I would say, for obvious reasons, Ric Esther Bienstock, who is my co-producer on this film. Her long list of titles (as both director and producer) would put any aspiring documentary filmmaker to shame. She has made numerous investigative, thought-provoking, and entertaining movies (in addition to winning a few Emmy’s and countless other awards), and having her come on board really changed the production and quality of the film. At a time when right-wing political parties seem to be on the rise, many of which promote anti-semitism among their followers, it is important to have pride and show interest in our cultural heritage. I believe it strengthens the community. I also believe it is important to continue screening Holocaust movies. Younger generations are not as educated about this terrible moment in history, and movies can help bring these stories back to the forefront, and ask important questions of young people today. 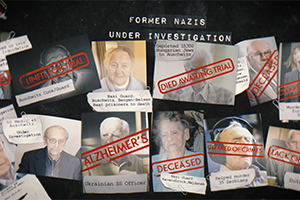 Watch The Accountant of Auschwitz during the 2019 JxJ.